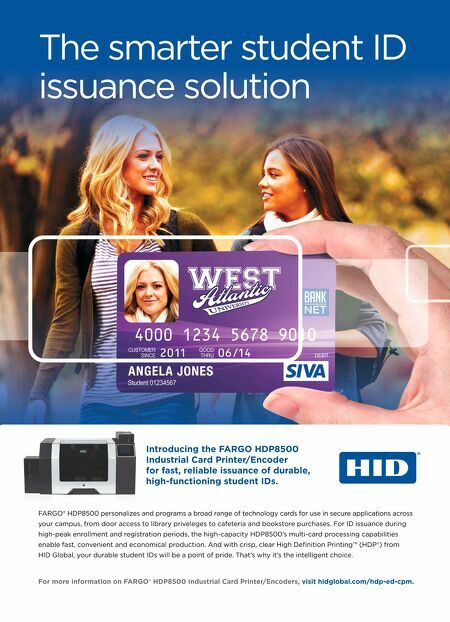 The smarter student ID issuance solution Introducing the FARGO HDP8500 Industrial Card Printer/Encoder for fast, reliable issuance of durable, high-functioning student IDs. FARGO® HDP8500 personalizes and programs a broad range of technology cards for use in secure applications across your campus, from door access to library priveleges to cafeteria and bookstore purchases. For ID issuance during high-peak enrollment and registration periods, the high-capacity HDP8500's multi-card processing capabilities enable fast, convenient and economical production. And with crisp, clear High Deﬁnition Printing™ (HDP®) from HID Global, your durable student IDs will be a point of pride. That's why it's the intelligent choice. For more information on FARGO® HDP8500 Industrial Card Printer/Encoders, visit hidglobal.com/hdp-ed-cpm.